Background: i like to keep pairs together so that they are worn together and wear out together…but mostly i like to reach in to my sock drawer and just grab a pair and go which means i sort them first. 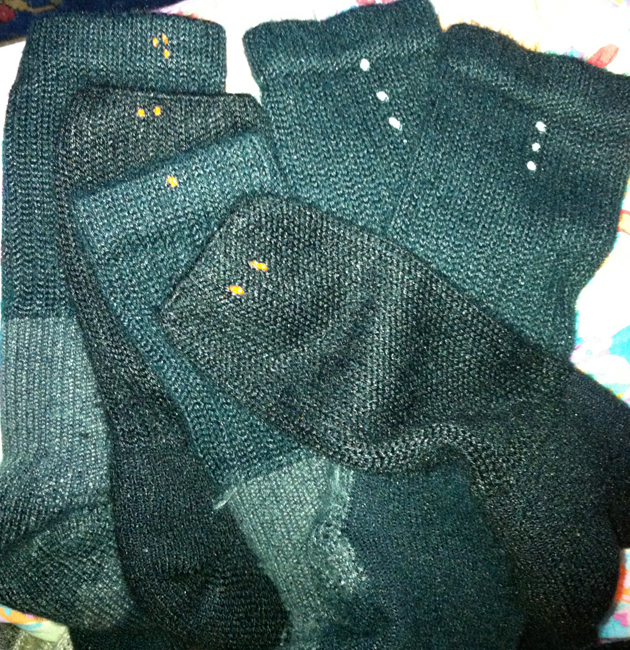 but, i agonize over sorting socks because i buy the same brand of black and brown and navy socks again and again. to make matters worse, my husband also likes the same brand and we have lots of identical-seeming socks! i used to spread them out in broad bright daylight to try to differentiate the vague differences in color from age or wear or size. even the same brand and size socks can vary in weave or length. keeping “mine” mine and “his” his is important to me. therefore, it took a long time for me to pair my socks. my friends and my husband all remained unimpressed about this; i thought that i may be the only person who cares so much about sorting my socks! not true, though… because when i showed my new idea to my mom, she also immediately grasped the idea and also adopted it! sorting them now is a breeze. I no longer have to examine every single black sock in order to pair them. say that i start with a black sock with a neon orange spot… if i next pick up a black sock and it has a neon orange spot… voilá, that pair is DONE. if sock #2 has a white dot, i place it with the white dot facing up and go on to the next black sock. #3 might be a match for either and if it is, that pair is also done. to give you a better idea, here is a photo i took with my phone one day as i was folding laundry! some of my black socks! more advice: my fabric paint advises label says to turn items inside out for washing so i apply the dots on the outside of the socks. i place the mark near the top center where it will not show when i wear jeans and where i look for the mark as i sort. i first experimented with right and left but found it to be more complex and it took more time. i can imagine a family where one person’s socks have blue dots, one person’s has green. or gray. or yellow. or taupe. a few questions about antique bath towels turns into a treatise! Wow! My customer’s questions show that textiles are a critical part of life. But they always have been. Hope chests and trousseaus were the collections of the household items that a girl would need throughout her lifetime. Depending on her financial status, it might be a very long time before she would be able to afford to buy anything to replace the things she brought into her marriage (or, if unmarried, into her life as a single person.) Fabric was precious and necessary. If a sheet wore through, it was turned into teacloths, towels and rags for cleaning. I have always wanted to get a few old linen damask towels to replace my modern terry-cloth towels, but I’ve always been a bit afraid [because] I wasn’t sure that I’d like them–nevertheless, I’m not big on modernity, either. But in many parts of the world today, (Italy and France are where my experiences have been) non-terry towelling was and is the norm and pressed damask towels adorn every bar and rack in bathrooms from the towel bars on the sink to the bar near the bidet and the hooks for the bath-sized towels. I was none-too-pleased when I first encountered them as a novice traveler in Venice! They just seemed weird! I’m not sure if the quality of modern terry-cloth towelling is just that much more inferior, or if instead they have always been a bit on the crummy side–then again, my grandmother still has most of her terry-cloth towels from the ’60s and they’re perhaps not as plush as today’s towels, but they seem more colour-fast and don’t seem nearly as ready for the bin as do the modern ones. so many grades of goods exist today! You can make do with really cheap stuff or pay more for items of nicer quality. You can also pay lots for items that turn out to be “not-so-nice.” Find something you like. The trend is toward softer and softer towels; that is what people think they want but I think that is because that ‘s what the manufacturers are telling them that they (the customer) want. My sister gifted me with some ultra-soft towels a few years back and we hated them. They were so soft that they did not dry anything! Years of repeated washing helped them and we also got a bit more used to them because I liked the color! I think people forget that towels are supposed to be absorbent and that fabric softener should never be used with them. Fabric softeners have become ubiquitous, though, and people seem to use them with everything. Especially dryer sheets! The dryer sheets basically coat your goods with smelly chemicals, yuck! Some people hang their towels to dry on clotheslines and even though they dry pretty rough, they certainly are absorbent. I often hang out my towels until they are 80-90% dry and then I bring them inside and use dryer balls to fluff them up a bit. BUT! I found websites that advise using dryer sheets in places where there are mouse problems. Mice can’t abide them. I used some dryer sheets under the kitchen sink once and found I couldn’t abide them either: I could smell their reek the moment I entered the kitchen! Oops, chemicals and textiles shall be the topic of another blog, another day. But, I do worry that so many people accept so many potentially carcinigious chemical smells into their homes and lives without much thought. They use Febreze and equate the Febreze smell with a clean house…. but I believe that a clean house should not smell! And, it certainly should not smell like an artificial chemical rain shower. But, all that aside, I’m not entirely certain that I really care for the modern plushness, anyway! But, I don’t really have anything to contrast it with, because I’ve only ever had, and used, terry-cloth. I did decide, when thinking about it, to towel off one day after a bath with an old linen table-cloth, which is larger than a towel, but smaller than most other table-cloths that I’ve seen. The pros: the antique linen is cooler (which, in heat, is a good thing); it’s less prone to collect lint and hair and then transfer it to ME; it seemed to wick off the water just fine. The con: it’s really thin, and (with a hand towel, for instance) therefore seems to require more of the towel to get one dry. But, on the other hand, the thinness seems to lend it to drying much more quickly (even if it DOES wrinkle). you have gone to so much more trouble and thought over this than most people! I’m impressed! Another really interesting characteristic of linen fibers is that they are ultra absorbent. BUT!!! And, here is the big but…. they have to be slightly dampened in order to really absorb more and they are hard to dampen when they are dry. Linen is a wonder fiber. Cotton is, too! They each have their wonderful uses! Linen is lint free and has superior drying ability… but only once you get it started! Yes, it wrinkles. Oh well. All that said, however, I’m still sort of afraid to start getting antique linens and throw out my modern towels, due to all the extra work that I’m sure is involved–the special washing, the pressing, &c. But you’re so knowledgeable on the topic of linens, that I wondered what you thought about it. I’d NEVER advise getting rid of perfectly good towels unless you found a super substitute (and unless everyone you live with also agreed that the change was for the better.) Linen towels need no special washing; linen is even stronger when it is wet. But, if you can not live with unironed stacks of towels, you either need to have trillions of them as backup, be an ironing fiend or have the luxury of sending them out to a laundry or housekeeper. (that’s not most of us) And, when I say that you might need to have trillions of them as backup, remember that, eventually you will have to iron them or live with them wrinkled. I have a sort of relaxed attitude when it comes to wrinkles but remember, I iron twenty million (exaggeration; it just feels like that many) things every year to sell. I don’t always get to my own ironing pile! Do you use antique towelling for everyday bathing (hope that question isn’t too personal!)? I never use fabric softener with towels. never. If I ever did accidentally, I’d rewash everything. In fact, that’s how we sort laundry in our house: Our categories are things that use fabric softener and things that don’t. Do you really think that modern “plush” towelling is an improvement? This is entirely a personal choice! One of my friends would never wrap cotton towels around her body! She’s a linen girl all the way! She has linen bathrobes, too. She once covered her floor with bolts of linen and varnished over it because she is such a linen nut. (I thought I was a linen nut but I have never gone that far!) Cotton terry is an improvement, however, in that it is affordable, decorative and easily purchased. In that it does not require ironing, it is also easy care. It does require a lot of energy to dry unless you hang it outside. That’s the other reason that damask and thinner towels are used in Europe and in places where electricity costs are sky high. We Americans may complain about our energy costs and gas prices but we have it really good! We can afford to use our washing machines and then run our dryers, too. We can’t even comprehend what high prices our European neighbors pay for energy! And why has terry-cloth become so ubiquitous–just because it’s cheap? Aha! Price always has something to do with everything. There doesn’t seem to be much on the internet about the history of towels…Then again, I guess that’s a small surprise as Western bathing, as a practice in itself, was hardly existent until relatively recently. That in itself would automatically lead me to the Japanese, as they have always been the cleanest culture around…but, all one really finds are Japanese wash-cloths, and honestly, I have no idea what they use for towelling (though a book on Japanese bathing says that they formerly used yukata for this purpose–that they would simply put the robe on after soaking, and then let it dry them while they wore it. But, that was centuries ago and the practice has discontinued as yukata have become Summer fashion. But that was all they said). So, that’s sort of a dead-end, too! I know these things seem terribly mundane, but, I find these differences in culture to be quite interesting. I have no experience with this except that I read a really great book that I loved but now can’t find the name. It was written by an American journalist who had lived for more than 20 years in Japan. I’ll think of it later! Oh, and one last thing. What exactly is the difference between a “guest towel” and a bath towel? Are “guest towels” even smaller? They are just the names that have stuck. But they do pertain to sizes. A bath towel is bath-sized, for drying when you are bathing the entire body. That’s when you need a larger size. The guest towel or hand towel is sized to be near a sink for when you are drying your hands. A kitchen towel ostensibly gets used in the kitchen… but, I think that they, too, mostly dry hands! Oh yeah, dishes, too. For that, they are great and are super for glassware because they don’t streak or leave lint. And, a kitchen towel is a great size to use other places besides the kitchen but I use the nomenclature to signify a fairly long, generously sized towel that looks like a runner. And, there is a tiny towel called a fingertip size that is also used to dry hands in a power room or sometimes during an extremely fancy meal that offers finger bowls for washing after a particularly messy food course! But that may be an etiquette question. My best advice: never use fabric softener on towels of any kind. And if you hate ironing but you hate wrinkles even more, linen may not be your best choice. linen fabrics! fiber content or generic name for household linens? OBSERVATION FROM A CUSTOMER: I had been a little concerned at the use of the word “linens” in your offerings, as it could refer to either material in a generic sense, or the fabric, i.e. made from flax. I know that the term linen can be confusing because it does have two meanings. 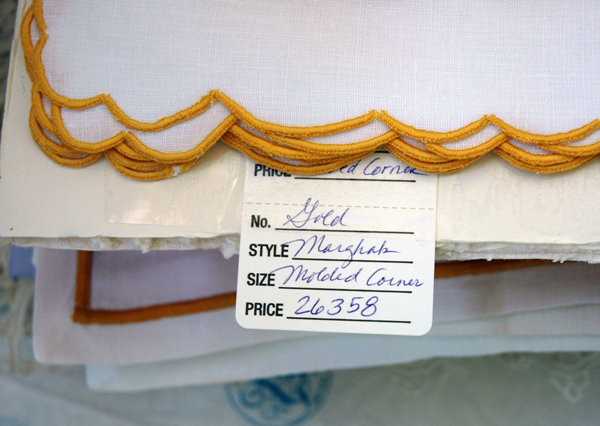 Household textiles are given the general term linens. We have linen cupboards or linen closets even though most modern homes store more things that are not linen than they do things that are! When I offer something on my website, I always identify the fiber if I know it. Sometimes I will even note that I can not identify it! Here is a recent question regarding storing linens. I had exactly this problem which was exacerbated by the fact that when a set of napkins were sold, I not only needed a way to find them easily but also to be able to pull them out of a box or a stack without wrinkling them or wrinkling the other items in the stack. My solution is to use cardboard panes, one for each set of napkins. But first I cover the cardboard in white tissue paper to keep the cardboard from touching the fabric. I tie ribbons around each set of napkins in order to keep them tidy and together. Lastly, I attach a tag that tells me what they are. I try to place each tag in a different place on the cardboard so that I can see each one at a glance and I keep them facing front. 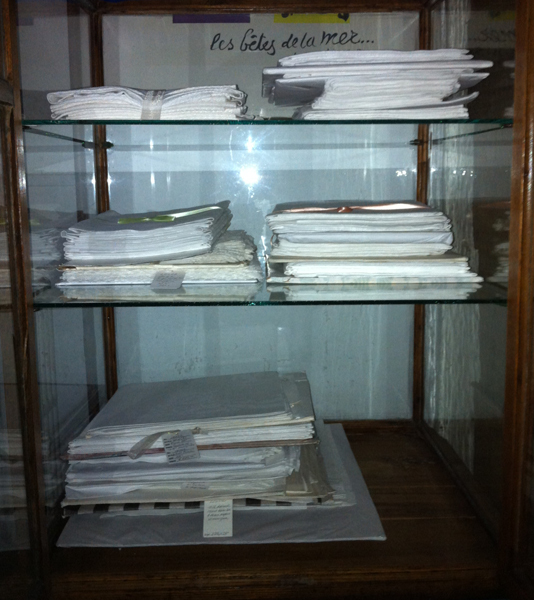 Napkins are stored on shelves in a glass cabinet which protects them from dust and humidity. Even if the set that I need is on the bottom, I can easily lift the entire pile, extract them and replace the rest because they are supported by the cardboard. The tag identifies a set of placemats in storage. The tags for the sets beneath this one are staggered along the front edge. Although I devised this system for myself through necessity, it doesn’t surprise me that other people have come up with similar systems. For instance, I recently acquired linens from an estate of persons of great wealth which meant that they had multitudes of everything. I was amused to see that all their linens had been sent out for laundering and the laundry had packaged the linens to perfection BUT had laid them directly on flimsy, inexpensive cardboard and then wrapped them in cellophane! 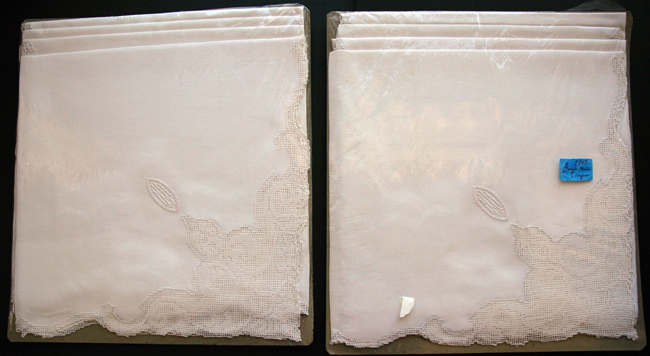 These napkins were stored for decades inside cellophane wrapping. Here is another close up. They looked lovely, all bundled up! But, when removed from the packaging, they were actually quite stained, much of it coming from being stored next to substances that off-gas chemicals. They were placed so carefully, alternating tops and toes, with only four to each package. I suspect that nobody could predict that they would be put away and not opened again for decades. 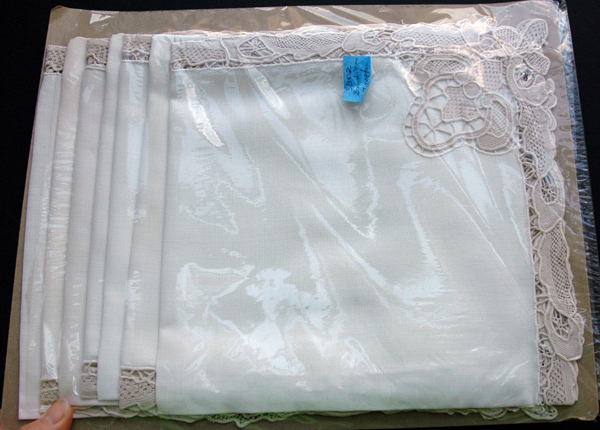 another pretty set of napkins tucked away in cellophane. It does take decades and decades of poor storage to ruin things, though. I have seen linens that were rolled in newsprint or on cardboard paper towel cores that were exposed to those particularly acidic papers for 40 or more years and, besides needing to be laundered, fared pretty well. The worst thing you can expose your linens to is humidity and damp! Go organize your linens! But enjoy doing it. I recently came upon some photos of Flanders lace and now I can not stop thinking about it. It has long been theorized that the designs are figural and depict monkeys. Here is an interesting floral progression. First: very old Dutch. This shows a central flowerhead flanked by mirror image leaves. Next: this lace is called “aape” which has been anglicized to the “monkey” design. But, doesn’t it seem to have the same flow as the 18th c. piece above? The next photo is the edging of a 20th century coaster. This may be the “Aape” design, just a few hundred years newer? The fineness of different threads is demonstrated in the next photo. Yes, I am an embroidery snob. But… I believe that things must be produced with inherent quality and thoughtfulness. The following photo shows a modern Turkish style pile loop cotton towel that has been embroidered with lovebirds. This towel is a major brand, called Yves Delorme and it cost over $40 in 2008. I loved the colors and loved the design but the quality of the embroidery is deplorable. I even turned it over to look at the back, thinking that the front side was the “wrong” side and that the back would be the better side. Nope. Thoughtfulness should extend to the overall piece. The pillow shams that match this Yves Delorme towel are of cotton printed with a delightful design of cockatoos, parrots and peonies that are spaced far apart against a leaf frond lattice background. They are attractive and well made but the makers did not make the one last effort that would have made them acceptable, or even extraordinary: I expected a cockatoo or a parrot to be centered on each sham. Moreover, since one side is white fabric and side number two is aqua, I expected a major design element to be present in the center on each side! But, they are made from any pieces of fabric and one has half a bird but most sides just have the lattice background. They do not include the motifs that I would consider most desirable and most expected. Instead, they feature the plain background with no centered birds. Yes, it’s cheaper that way to use leftover fabric scraps and turn them into shams. I think it’s also shoddy and lazy. They just don’t expect anyone to notice. I made a movie of a woman making bobbin lace at the Kant Museum. She is amazing. The lacemaking demonstration took place in September 2008 in Bruges, Belgium at the lace museum, called the Kantmuseum. You will be as astonished as I was if you have never before seen bobbin lace being made by hand. The lacemaker uses a pattern which she keeps beside her and she glances at it from time to time without stopping her hand movements. I will update the movie link soon. I saw (in person!) bobbin laces that I have only ever read about in books. One lace, called “Binche” (pronounced “bansch”) has a reseau called “fond de niege” or “snow ground” because the ground looks like snowflakes. It’s remarkable. This is a round tablecloth with exquisite peacocks. More peacocks decorate a superb handkerchief. This is a lappet (or barbe) made in point d’Angleterre. Some gorgeous handkerchiefs were on display. The lace is called “Toveressewerk” in Flemish. The following handkerchief is embroidered with spectacular whitework flowers. There was a remarkably similar one in the Irma Lace Shop for sale for around $2,000. A coronet crowns this deer bobbin lace cartouche. Windmills, swans and castles flow around this tea-sized tablecloth. Delicate flowers and embroidery trace ethereal designs on this tablecloth edged with superb lace. Note the picots on the brides of the point de Venise ground. 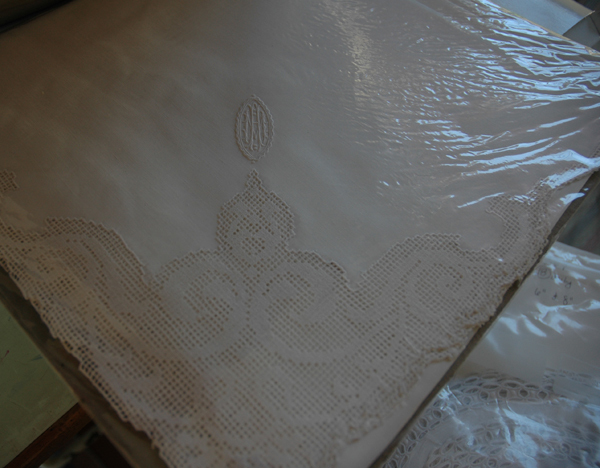 This point de Venise (needlepoint lace) tablecloth features putti (winged cherubs) shaded in half stitch. with a portrait of the Virgin Mary. These laces are no longer being made. Thread this fine has not been made for more than a hundred years. And, even if the raw materials were available, there is no longer any one with the ability to make it. Here is a movie of a lace making demonstration at the museum. The woman who is making the bobbin lace uses a pattern which she keeps beside her and she glances at it from time to time without stopping her hand movements!